- snow. Or rather taking advantage of what's around in winter time. Turns out that there's lots of snow just a couple of hours away. Why not? Learning how to ski also sounded like fun, so there I was, in my new bright red jacket, big white gloves and even bigger smile on my face. All in all is was not so bad, and most important - not as cold as I feared. With a bit of luck, the slope gets full sun exposure, and I got a bit of it too. Nice and warm. Two hours later I learned how to turn and stop - standing or sitting position. My legs were a bit tired, bruised here and there but I think I'll go skiing again. At home there was a nice soup waiting for us. Green and very warming. In a big pot, heat olive oil and add finely chopped onions. After a couple minutes add asparagus pieces and continue frying for a few more minutes. Add bouillon and cook for about 15 min, until asparagus becomes soft. In a separate frying pan, fry the asparagus tips for a couple minutes. Prepare pesto - grind basil leaves, cheese, pine nuts, garlic and olive oil in blender or food processor. Transfer the pesto/asparagus cream back to the pot with bouillon. Stir and serve! 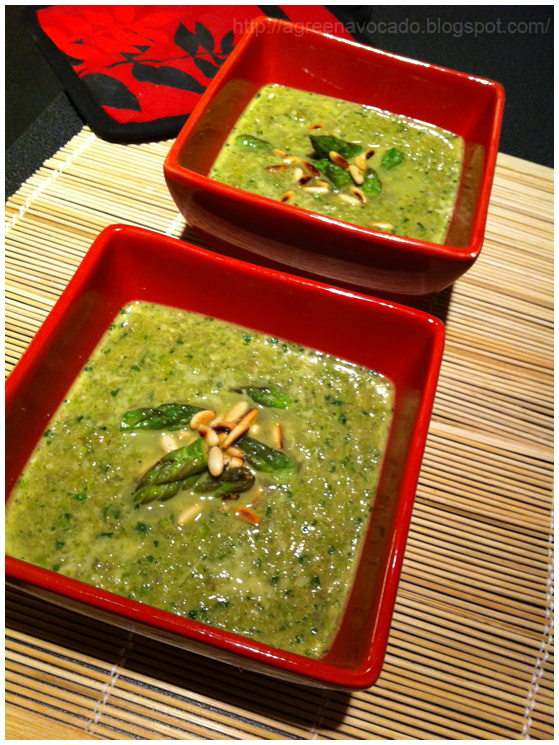 Decorate the bowls with asparagus tips and pine nuts. I discovered this soup recipe here, but decided to make it even more pesto like and enriched it accordingly. And yes, I realize it's been a bit too green here, so promise to prepare something sweet and not so green next time.